TowBoatU.S. 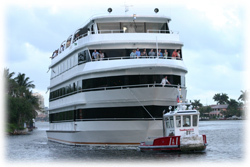 Fort Lauderdale has offered service on the busiest river in Ft. Lauderdale for many years. In 2005 TowBoatU.S. New River was established with additional tugs to accommodate the growing demand. TowBoatU.S. Ft. Lauderdale is an expert in the mega-yacht industry. We are proud of our excellent safety record and staff of experienced yacht towing captains. 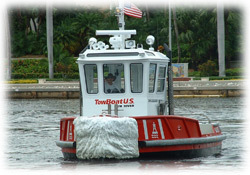 Whether you need docking assistance, tug assistance within a local boatyard or marina, or towing services on the many rivers and waterways throughout South Florida; make TowBoatU.S. New River your first call. Shillelagh is a 26' Custom Steel Tug, with twin 225 hp John Deere 6068 engines with 3:1 gears and 34" propellers. It was originally designed for salvage work both offshore and inshore where a vessel of compact size with substantial power was required. The hull is of extra heavy, all-welded steel construction, with Fernstrum keel coolers and fully protected running gear. "The length, maneuverability and power of Shillelagh make it the perfect tug to use in assisting our yacht customers on the New River," states John (Barney) Hauf, Director of Sales. "No other tug in the area has that combination." In addition to our specialized equipment, we have the benefit of a skilled, experienced crew. Our captains take great pride in providing prompt, reliable, professional service to our customers and are excited about our Yacht Towing Division. TowBoatU.S. New River has twenty United States Coast Guard licensed captains that are employed full time by our company. Each captain receives rigorous training, after years of experience towing recreational vessels of increasing size; they gain the experience to safely and confidently assist our yacht Customers. You can rest assured that our yacht towing crew has excellent local knowledge and will perform each tow with care. TowBoatU.S. Fort Lauderdale also offers crane services, for more specific information on our Yacht Crane Services, Click Here. Navigating Ft. Lauderdale's New River can be a challenge for even the most experienced captain. The New River is filled with confusing markers, twists and turns, currents and very tight quarters. Our yacht towing department wrote an article on "Local knowledge of the New River." 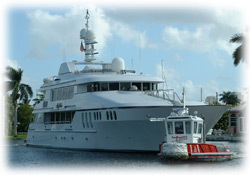 The article was published in The Triton, a monthly newspaper geared toward the interests of megayacht crew. Click Here to view a copy of the article.